Rotunda Hospital told to provide abortions up to 12 weeks as set out in legislation. HEALTH MINISTER SIMON Harris has confirmed that the Department of Health’s chief medical officer has informed the Rotunda maternity hospital that it must offer abortions up to 12 weeks, not 11 weeks as it had been doing. Last month, it was reported that the Rotunda would not provide abortions for women at more than 11 weeks’ pregnancy. The Health (Regulation of Termination of Pregnancy) Act 2018 says “12 weeks of pregnancy shall be construed accordance with the medical principle that pregnancy is generally dated from the first day of a woman’s last menstrual period”. The Master of the Rotunda, Fergal Malone, told The Irish Times that doctors were fearful of criminalisation over the issue. Concerns about the timeframe were raised by the Institute of Obstetricians and Gynaecologists, which claimed there was “ambiguity” on the issue of the 12-week cut off. It is understood there were concerns that it is not legal to commence a procedure after 12 weeks and issues were raised in relation to cases where commencement occurs before 12 weeks but the procedure may take longer than expected, and therefore breach the 12 weeks. He said that as the CEO of the Rotunda Hospital, he has an obligation to care for patients but added that he also had an obligation to care for his staff. The health minister was asked about the the hospital pulling back from the 12-week period at the Oireachtas Health Committee. When asked if the hospital was in breach of the abortion legislation, the minister said the 12 weeks is the outer limit as set out in the legislation, adding that “12 weeks is the cut off, not 11 weeks”. He told the committee that the chief medical officer for the department has “helpfully” written to the Rotunda “to provide clarity”. 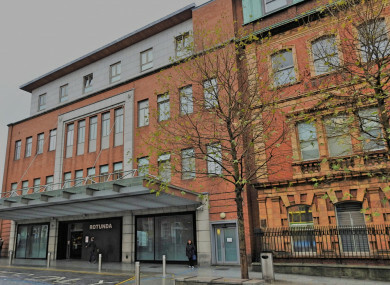 The Rotunda Hospital will be providing termination of pregnancies to 12/0 weeks. Separately, Harris was also asked to address the recent alleged data breach relating to a woman who had an abortion carried out in the National Maternity Hospital in Holles. TheJournal.ie reported last week that a HSE investigation was underway into the allegations that a woman who had a medical abortion was later contacted by someone using a phone number linked to an ‘abortion counselling service’ that the HSE has warned against. He said yesterday that he was “extremely disturbed” about the allegations, adding that the hospital CEOs are investigating if the data breach happened. “We won’t tolerate such data breaches,” he said, adding that all patients, not matter what procedure they undergo at an Irish hospital, are entitled to privacy. Email “'The law is the law': Rotunda maternity hospital told to offer abortions up to 12 weeks, not 11”. Feedback on “'The law is the law': Rotunda maternity hospital told to offer abortions up to 12 weeks, not 11”.